Delta Force Paintball has never been one to remain stagnant. The company is constantly researching and investigating new ways to advance paintball, provide a better class of game than it’s competitors and encourage changes to help more people discover and enjoy the thrill of paintballing. Due to state laws governing the determination and use of a firearm, young people in both the Australian Capital Territory and Victoria were left only to watch on as their older friends and siblings enjoyed the fast paced, quickly developing sport of paintball. Realising that a plethora of youngsters were missing out and keen to play as well, Delta Force Paintball set about negotiations with the relevant governing bodies to find a way to include a younger group of players in this popular recreation. To this end, and after many a meeting, Delta Force Paintball pioneered MiniBall in Australia for the ACT and VIC. MiniBall was rolled out one year ago this May and the company wants to celebrate this milestone by encouraging MiniBallers from across the two states to enjoy a game throughout the month of May. 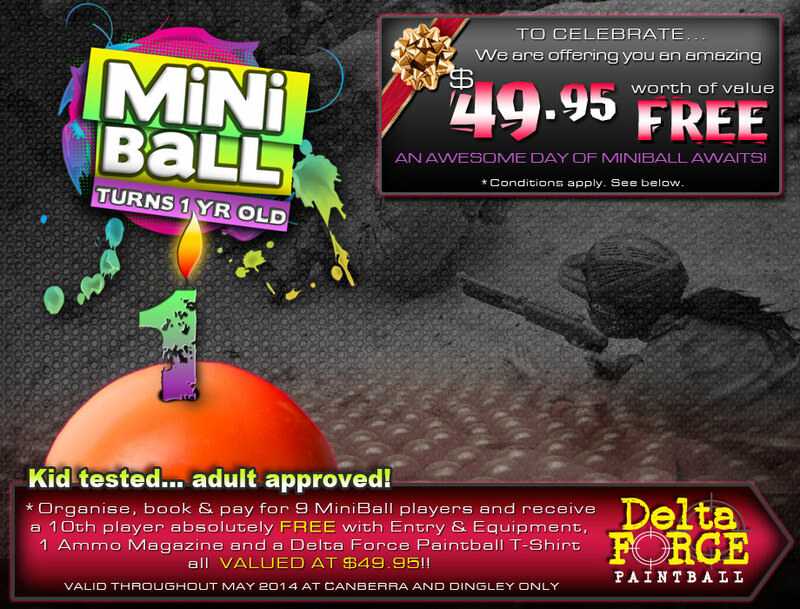 As such, any player who organises, books and pays for 10 players (including themselves) to play MiniBall at either the Delta Force Canberra or Melbourne locations will receive a free, modern design paintball t-shirt, a free ammo magazine worth of MiniBalls and free entry and equipment hire as well. A total value of $49.95 just for being your game organiser of 10 players. MiniBall has been specifically designed as a safe but still exciting alternative to the standard compressed air charged paintball game, instead using pump action shotguns using a powerful spring mechanism that propels the MiniBalls with surprising effect. MiniBall players get to play on the same full sized fields of play and under professional supervision with specific rules of engagement designed for their fun, safety and enjoyment. They are kitted out with full protective paintball combat gear so they are not only safe but enjoy the full spectrum of the paintball game. Played by combatants as young as 10 yrs old and up to 17 yrs in Victoria and 16 yrs old in the ACT, our first full year of MiniBall has proven a highly successful form of enjoyment, activity and bonding for those who have played it. To book a group in for MiniBall call 1300 793 702 above or click here to Book Now. Valid at the Delta Force Paintball centres in Dingley and Canberra for MiniBall events only. This promotion entitles you to a 10th player free with free entry, equipment hire, one ammo magazine and a Delta Force t-shirt when you book and pay for nine players for a game to be played in May 2014. Minimum ages apply. Please call to confirm the minimum age at your selected centre. We advise booking at least two weeks in advance to secure your desired date and location. This free offer cannot be redeemed in any other format other than stipulated above. There is no cash alternative to this free offer. 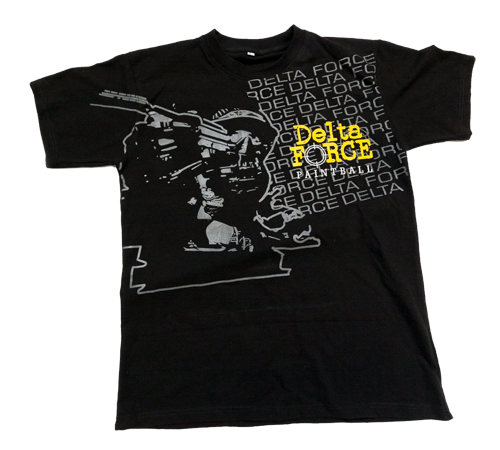 The offer of a free Delta Force t-shirt is while stock lasts. Sizes are limited – your desired size may not be available. If there is no stock available then no alternative will be offered.